Pike are a family of fish that have been around for tens of millions of years. Some of the more common species include northern pike, muskellunge, chain pickerel, and grass pickerel. 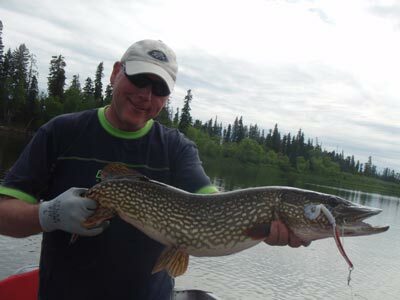 This section will look at the most popular angling fish of them all, the northern pike. The northern pike is a long and slender fish with a duckbill shaped mouth and lots of needle sharp teeth. The dorsal fin is soft and located near the tail fin. Northern pike also have numerous white or yellow spots on their sides with a dark green or olive background body coloration. They also have dark spots or wavy lines on their fins. Upwards of 60 pounds (27.2 kg) and approaching six feet (1.8 m) in length. Can be found in the Northern Hemisphere across the globe, including Europe, Russia, and North America. They inhabit rivers and lakes in most of Canada, but are rare in BC and the Atlantic provinces. In the United States pike are located in many different states that are more north or have colder temperatures. Northern pike prefer clear water with dense cover in the form of aquatic vegetation or logs and tree limbs. Typically 15-20 years, but can be as many as 30. Usually fish but will eat anything it can fit in its mouth including small birds and mammals. Northern pike spawn shortly after the ice thaws in early spring. Females spread between 15,000 to 75,000 eggs freely into vegetated areas. As the eggs settle they adhere to vegetation, rocks, sticks and other debris until they hatch in about two weeks. Adults have few natural predators, but juvenile pike can fall prey to other pike, walleye, muskie, and bass. Information courtesy of Ohio Department of Natural Resources. Pike, also known as northern pike, is one of the most sought after fish in fresh water. They are generally found in Canada and the northern states of the US. These are rather large fish that can top 50 lbs and be around 50 inches or longer. They are highly aggressive and predatory, making them a premiere game fish in North America. 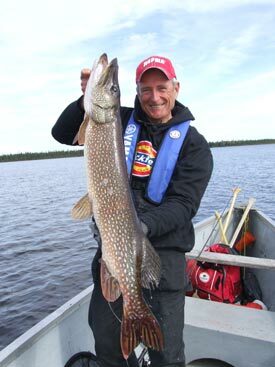 This article will elaborate on northern pike fishing in Canada and also the United States for its focus. It will cover, in addition, some common ways of catching these majestic fish.For those who want to have a fun time angling, pike are some of the best fish to go after. 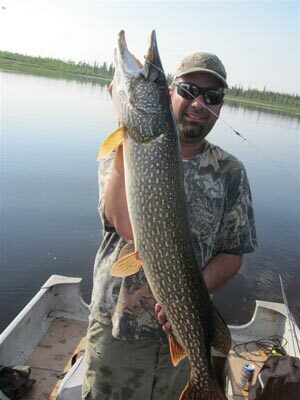 There are a lot of pike fishing spots across North America to choose from. There is a lot to learn about pike fishing because these big fish take a while to get to know and catch regularly at a large size. Of course, getting pike fishing reports can be a huge help, but there is no replacement for a good northern pike fishing guide that knows all the best pike fishing locations in the area. The reality is, guided pike fishing can't guarantee success, but it can make pike fishing at nearly any destination much easier to do and ensures a higher success rate. Fishing for pike in Canada is an amazing experience. The Northern Pike, or "water wolves" as they are sometimes known, are seriously hard fighting fish who can accelerate at remarkable speeds. Whenever a pike is hooked, there is sure to be a battle. These fish have a diet that consists mostly of other fish, but have rarely ever been known to shy away from eating other things, such as young ducks or rodents. Many times, pike will also eat another pike, even if it is the same size. Pike have an incredibly aggressive nature and have often, in their attempt to strike at a hooked fish that is being brought up to a boat, enabled an angler to catch two fish at once!Manitoba is one part of Canada that is well known for both walleye and pike fishing, but Canadian pike fishing in general is a very popular past time. Many anglers come from around the world to enjoy this sport because the reputation for Canadian northern pike fishing is nothing short of legendary. In fact, even US residents often make a special trip north just to indulge in the fun each year at various pike fishing lakes. There is no specific season to catch northern pike, and they can often be caught all year round, where regulations permit. In fact, some of the best northern pike in Canada often takes place through the ice. These fish can grow quite large, weighing up to and over 50 pounds, and can reach 60 inches in length, on the bigger end of the scale. This is why there are so many pike fishing lodges in Canada today. 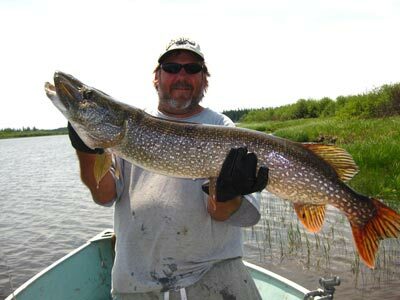 Some people believe that lake pike fishing in this country is the top pike fishing in the world. Whether or not it is the best northern pike fishing is up for debate, but it is definitely good pike fishing. A fishing guide for pike can be found here easily, so be sure to take advantage of this since they have plenty of pike fishing tips that anyone could benefit from. True to the water wolf nickname, ambushing its next meal is what a pike does best. Lurking around sheltered, sometimes weedy areas, such as beaver dams or even trees that have fallen into the water, they hide and blindside their food in a sideways or from behind attack that is certain death for their prey. 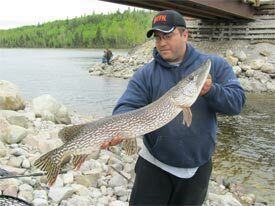 Not only do these exciting fish call for a great fishing experience, they are excellent for eating as well - just another bonus of Canadian pike fishing that locals and visitors enjoy equally. However, they are a boney fish, and special care should be taken to remove the Y-bone from the fillet. Also, smaller pike usually have better tasting meat, so selective harvest is a must. Dead bait is by far the number one method to generate pike strikes every year. It can be especially effective in the spring when pike fishing from March to May. For their meals, larger pike generally chase one or two pound perch or walleye. However, using live bait is illegal in many places so be sure to check guidelines and restrictions long before you go pike fishing. Shallow waters with weed beds are the best bet in the spring time after the females have finished spawning. The strategy of using dead bait during this time will almost guarantee success because the pike are looking to score an easy meal. If you are planning on releasing pike that you catch with dead bait then remember to set the hook quickly. This will prevent the pike swallowing the bait. Barbless hooks are also recommended. 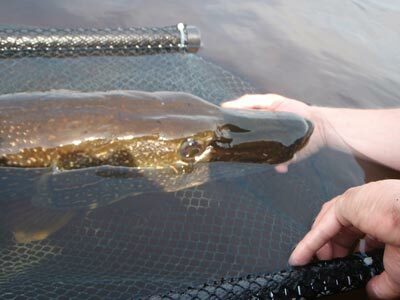 Although dead bait fishing for pike is the best during springtime, if an angler finds the right kind of deadbait and location during other times of the year, it is possible to have a lucrative trophy northern pike fishing experience as well. Good alternatives to dead bait include topwater poppers and plugs, large soft plastic flukes, spoons, spinnerbaits, and large jerkbaits. The pike's habit of striking almost every lure, out of hunger or aggression, makes it one of the easiest fish to catch. While dead bait fishing is the best strategy for pike fishing during the early spring, there are other tactics for other times of the year. With Canadian and US northern pike fishing, the temperature at which one fishes is indicative of the size of fish they are looking for. The larger, trophy pike are found in 50 to 55 degree water while the smaller pike enjoy the warmer water, around 75 degrees. If someone is fishing for a large pike, generally it is best to use a large lure, because they search for prey that is between 10 and 20 percent of their body size. Another rule to remember when fishing for large pike is that, in addition to having a strong wire leader, make sure there is at least 15 pound test line on the reel to handle the stress of a fighting pike. It is common for anglers to use 30-60 pound test when exclusively targeting pike because the fish are known to roll in the line. As they roll, their sharp gill plates can easily cut through light fishing line. 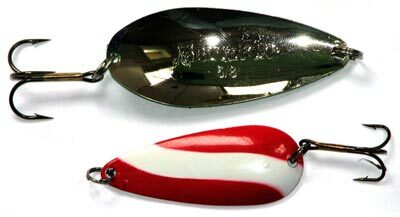 The type of lure that has shown the most promise in catching pike are the red and silver spoons, between 3 and 4 inches long. Spoons usually work best during the summer and fall pike fishing season. Spinners are also a good idea during the summer and late spring pike fishing season. For top water pike fishing baits, buzzbaits are fun, but the best results can come from floating minnow baits and plugs. Regardless of the type of pike fishing bait and lures being used, the one constant thing to always factor in is the weather. The best time to fish for pike is during windy days. The chop on the surface brakes up the amount of sunlight that penetrates the surface, allowing pike to roam freely throughout the day. Wind swept shorelines usually have a concentration of baitfish that are feeding on insects and plankton that have been stirred up in the wind, and pike follow to feed on the baitfish. Winter pike fishing can often be a tricky affair due to the level of cold that sets in. With that sharp, northern cold comes ice over the water. This is when people go ice fishing for pike and it is quite true that a pike fishing guide for first timers is crucial here. It is easy to get hurt in these conditions, so be careful because you want to be around for more monster pike fishing in the future. Pike fishing secrets take quite a while to learn, but if you are patient and stick with it, you will learn which northern pike fishing techniques work best for you. Don't let those early pike fishing experiences ruin it for you - with time and knowledge gained from fishing books about pike and other sources, such as solid advice from capable anglers, you will grow more and more with every outing. Your best pike fishing comes with time, so stick with it, but in the mean time it is good to think about various ways of learning more. Books about pike fishing gear are a good place to start. There are plenty of pike fishing reels to learn about, along with pike fishing rigs that are going to perform the best. You may not have the cash for a pike fishing boat, but you can always take advantage of fishing charters for pike. Sometimes these will even give you access to pike fishing equipment you might not otherwise have been able to use. For a fishing rig, pike prefer a variety of options and having access to these, along with the proper line that pike fishing requires is definitely paramount. Some love fly fishing for pike and this is definitely possible as far as pike fishing tactics go. Fly fishing for pike is not always easy, but if you learn from books or a guide, you will have better results. River pike fishing is popular and if you have the right pike fishing flies tied just for the fish you're after, it can be a very fulfilling experience.Remember to take the time to get some pike fishing pictures holding your catch, especially if you plan to release it, because memories are what fishing for pike is all about. If you get good enough, maybe one day we will see you in a pike fishing tournament!